In the Netherlands and England, Shell released its most definitive statement yet on its low-carbon future and committed to 50% lower emissions by 2050 and net zero by 2070 in its operations and emissions from its fuels. The road, to Shell, is apparently paved with good intentions. In its analysis of future energy demand, Shell noted that the global energy demand is set to increase from 570 exajoules to 1000 by 2070 and it will take extraordinary measures to meet the stringent carbon-reduction goals set in the Paris Agreement, while the world is increasing energy usage at the same time. But Shell reaffirmed its support for the Paris Agreement, while noting certain extraordinary consequences of the required re-shaping of energy supply, including biofuels supply exceeding petroleum by 2100 in the company’s “Sky” scenario. 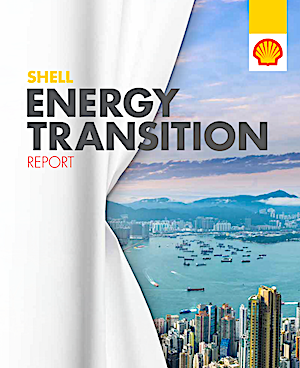 In the new Shell Energy Transition Report, available here for download, the company updated what it calls its Mountains and Oceans scenarios and introduces a third, Sky. The company was at pains to present scenarios rather than projections about the long-term future. For example, in Mountains, strong governments and powerful economic actors work together to create stability and maintain their own interests. This enables big initiatives like the deployment of carbon capture and storage (CCS) at scale or the building of widespread gas and hydrogen infrastructure. In contrast, in Oceans, competitive markets and a strong private sector are the main engines of change. There is major technology innovation, but big coordinated initiatives are more difficult to achieve. Energy needs are increasingly delivered through a patchwork of initiatives. Both Mountains and Oceans deliver net-zero emissions (NZE) from the energy system by the end of the century. But they fall short of the temperature goal of the Paris Agreement. Sky builds on this earlier work and assumes that society takes actions so as to meet the Paris goal. It requires unprecedented and sustained collaboration across all sectors of society, supported by highly effective government policy. By 2050 we intend to match the Net Carbon Footprint of the global energy system. To achieve this we need to go even faster than society because our starting point is higher. It will likely mean we need to reduce the Net Carbon Footprint of our portfolio of energy products by around half from its current value of around 83 grams of CO2e per megajoule, to around 43 grams of CO2e per megajoule by the middle of the century. We plan to reduce our Net Carbon Footprint by around 20% by 2035 as an interim measure. ■ Selling the fuel produced by 25 biofuel companies the size of our joint venture Raízen in Brazil. ■ Selling the output from 200 large offshore wind farms the size of our planned Borssele wind farm in the North Sea. ■ Changing the proportion of gas in the total amount of oil and gas we produce, so that natural gas increases from 50% to 75%. ■ Selling enough electricity on our forecourts around the world to meet three times the total demand for power in the Netherlands. ■ Developing the capacity of 20 CCS plants the size of our Quest CCS plant in Canada. ■ Planting forests the size of Spain to act a carbon sink for emissions that still exist. Today’s energy system is the result of many decades of choices by consumers, energy suppliers and governments. Societies want energy that is reliable, widely available and affordable. As a result, hydrocarbons account for more than 80% of the energy mix. Mobility: The percentage of internal combustion engines (ICE)in passenger cars falls from 100% in 2010 to around 75% by 2030. By 2050, it is impossible to buy a new passenger vehicle powered by an ICE anywhere in the world. Electricity: The share of electricity in final energy consumption rises from 18% today to 26% by 2030 and grows to as much as 50% by 2060. Renewable energy overtakes fossil fuels such as oil, gas and coal as the primary source of energy in the 2050s. 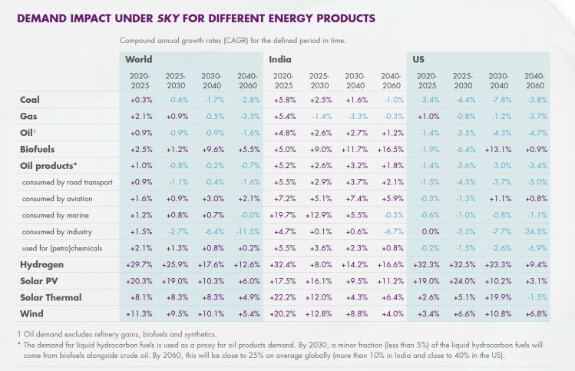 The world uses hardly any fossil fuels in the power sector after 2060. The share of nuclear in the global electricity mix remains steady at around 10% to 2070. A new addition to the sector is generation from biomass combustion, which is linked with CCS to offer an important carbon sink. 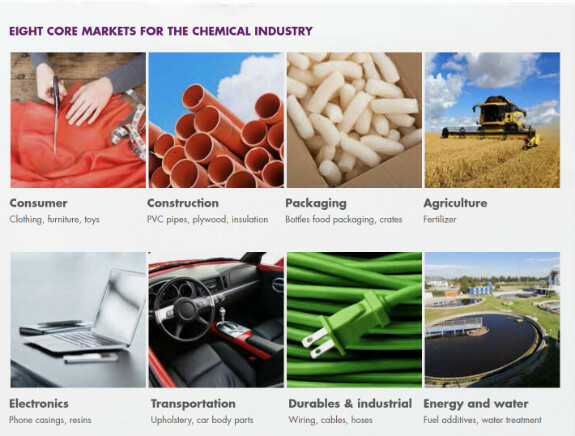 Industry: Sky assumes that industrial applications are electrified where possible. To provide the negative emissions required to achieve net-zero emissions from the energy system, Sky requires the construction of around 10,000 large CCS plants by 2070, compared to fewer than 50 in operation in 2020. Land use: Sky achieves net-zero global deforestation by 2070. In addition, an area the size of Brazil being reforested offers the possibility of limiting warming to 1.5°C, the ultimate ambition of the Paris Agreement. 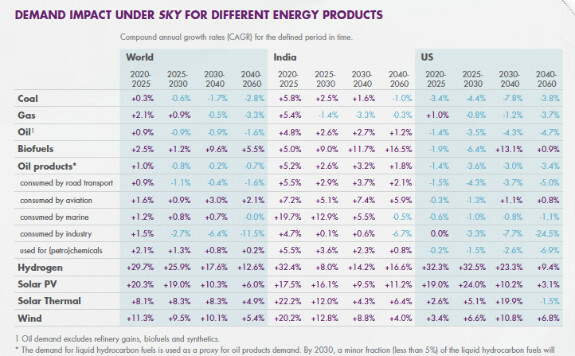 Hydrogen: The share of hydrogen in total final energy consumption rises from less than 1% before 2040, to 6% by 2070. It is used as a high-density and storable energy source in transport and industry. Importantly in Sky, it is produced from water electrolysis using mainly renewable power. 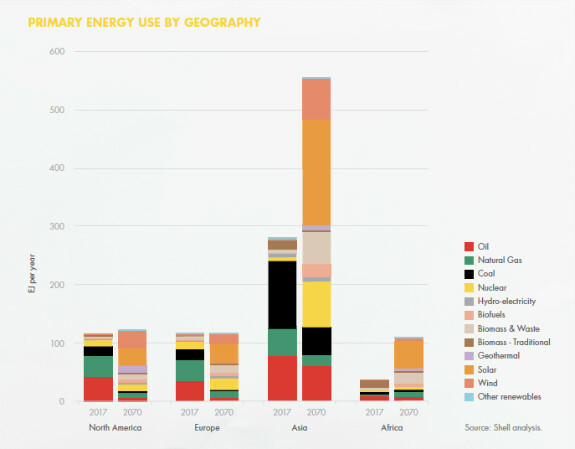 The Shell portfolio is, thereby, on the verge of a major shift. The “New Energies business is exploring new fuels for transport, where our activities range from developing advanced biofuels, made from waste and non-food plants, to launching hydrogen refueling stations and recharging for electric vehicles,” the company said. So, a sort of “All of the Above” ambition. 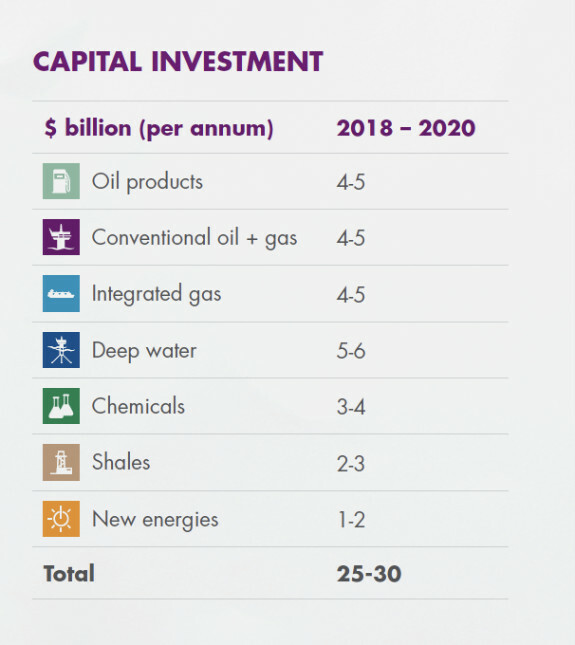 One is left to imagine how the investment options and decisions would look if the company decided that it needed only the same returns in advanced liquid fuels that it expects from new power investments, instead of expecting advanced fuel projects to be 100% competitive with established fossil fuel technologies from the get-go. “Biofuels today make up around 3% of global transport fuels and we expect their share to grow as the world shifts to lower-carbon energy. Shell is one of the world’s largest producers of biofuels made from sugar cane, through our joint venture in Brazil called Raízen. Raízen (Shell interest 50%) produces low-carbon biofuel from sugar cane. This Brazilian sugar cane ethanol can emit around 70% less CO2 compared with gasoline, from cultivation of the sugar cane to using the ethanol as fuel. In 2017, Raízen produced around 2 billion liters of low-carbon ethanol from Brazilian sugar cane. Shell is also one of the largest blenders and distributors of biofuels worldwide. We purchase biofuels to blend into our fuels to comply with country regulations and mandates. “We are active in the development of advanced biofuels made from alternative feedstocks such as waste and cellulosic biomass from non-food plants. In 2015, Raízen opened its first advanced biofuels plant at its Costa Pinto mill in Brazil. In 2017, the plant produced 10 million liters of cellulosic ethanol from sugar-cane residues. It is expected to produce 40 million liters per year once fully operational. The Digest noted the absence of any specific mention of VIrent technology — although Virent’s approach certainly fits under “advanced biofuels made from alternative feedstocks such as waste and cellulosic biomass from non-food plants.” But we also wonder whether there will be emphasis on technologies like Virent to deliver renewable chemicals, because Shell’s ambitions in chemicals are increasing substantially even as it looks to reduce its petrochemical dependencies. 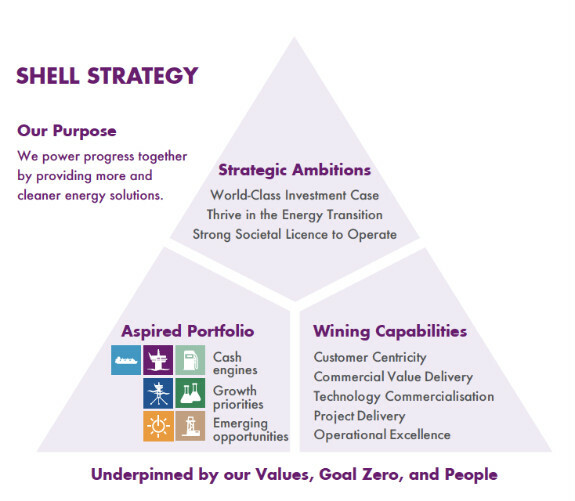 Hydrogen Council In January 2017, Shell and other companies launched the Hydrogen Council, a global coalition of chief executives working to raise the profile of hydrogen’s role in the transition to a low-carbon energy system. The council seeks to accelerate investment in the development and commercialization of the hydrogen and fuel-cell sectors. It provides recommendations to ensure appropriate conditions are in place to facilitate the deployment of hydrogen technologies. The council comprises 18 CEOs of energy, transport and industrial multinationals. In January 2017, the council published a report: “How hydrogen empowers the energy transition“ which further details hydrogen’s potential. 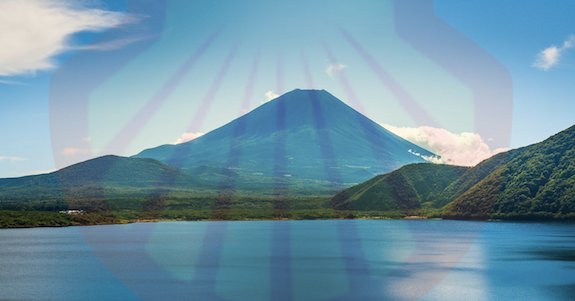 In November 2017, the group launched a second report, called “Hydrogen, scaling up,” outlining a path to greater hydrogen deployment and its role in the energy transition. Energy Transitions Commission. In 2015, Shell helped establish the Energy Transitions Commission which aims to accelerate change towards low-carbon energy systems that enable robust economic development and limit the rise in global temperature to well below 2°C. The ETC brings together leaders representing a wide range of sectors and interests: investors, energy companies, innovators, industrial energy users, nonprofit organizations and research institutes. As of October 2017, the ETC had 29 members. It is chaired by Lord Adair Turner and Dr Ajay Mathur. Chad Holliday serves as Shell’s Commissioner. There are scenarios, Scarenarios, and there is the real world to come that will likely be neither. 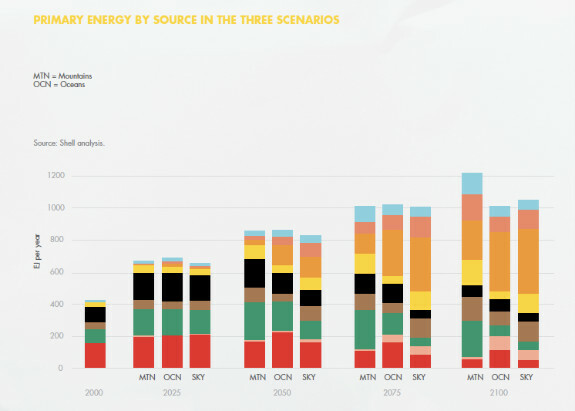 Let’s put that into perspective, these are not projections, these are estimates of likely situations and Shell is making business decisions based on them. In the long-term, these are striking changes but they are evolutionary. In some ways, this is an attempt to put Shell’s investments into context for potential critics adopting a “hurry up” posture. 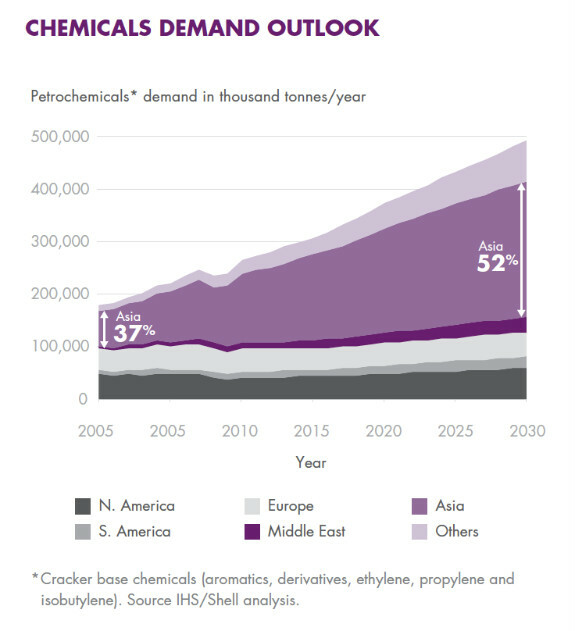 The biggest changes in Shell’s business come between 2030 and 2050, in which it turns sharply towards renewables as hydrocarbon demand slows. For those welcoming a low-carbon future, it’s good news. For those looking for energy companies to maintain earnings, it’s good news. But not tomorrow. We note the appetite for power projects with an 8-12% return while requiring 15% for advanced fuels. That clearly reflects the hurry-up in this document, which is less about Paris and more about a desire to get into the business of producing and delivering electricity as a world-scale replacement for producing and delivering fuels. Lower returns for strategically vital projects — that’s been accepted at big companies for a long time. Advanced fuels? To the extent that they compete head-to-head with conventional fuels, Shell will be delighted to do them, and is investing in technologies that it believes will achieve that. But Shell hardly needed an Energy Transition report to justify fuel projects that meet current investment hurdles — that’s energy-as-usual, not energy transition. The Energy Transition that is leading to this report comes in the form of electrons. The company is advising regulators that electricity will lead Shell towards meeting its Paris Agreement goals. Meanwhile, the company is advising shareholders that it sees not only “freedom to operate” in a future dominated by electric power, it sees good business too.